BathTime Baby Bear can be played with in the pool or bath tub and has a quick-dry body. 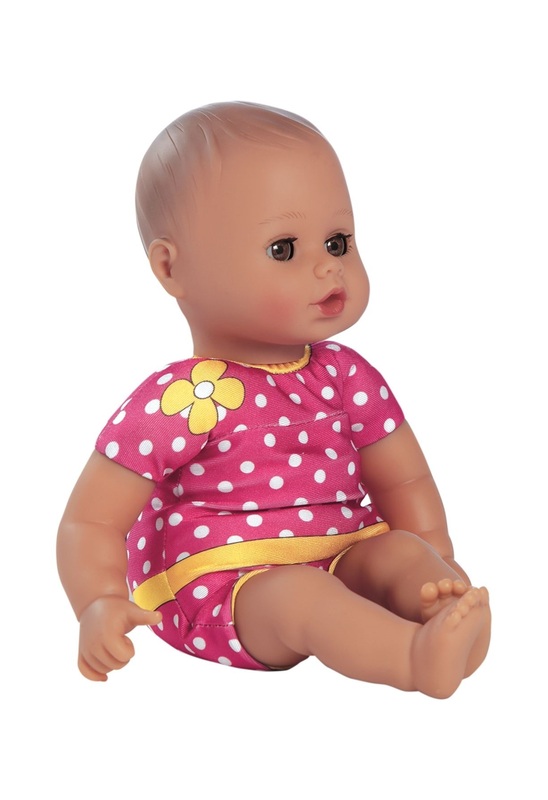 Adora BathTime™ baby Bear is the perfect doll for the bath, pool or any water fun! Comes with its very own washcloth and removable embroidered Bear themed bathrobe that when taken off shows an adorably cute swimsuit printed body! From the tiny little nose to baby belly button . . . it’s a perfect blend of sweetness and love for infants on up. The exclusive “QuikDri™” body will dry in no time and be ready to play again! BathTime Baby Bear measures 13 inches (33 cm) and has vinyl arms, legs and head. It can be washed in the washing machine. Place doll in pillow case and wash on gentle cycle. Air Dry Only.